Meg Day told her assistant Director “no show I’ve done has ever been this on track.” That was until their venue was found to be riddled with asbestos, just weeks before opening night. The thing I love about theatre is that it is malleable – plays and musicals exist well and truly beyond the contexts in which they were written, and each time they are performed they have the power to speak to new audiences. Annie is not a musical I thought I would direct. Yet, when (Sydney’s) Regals Musical Society asked me to direct their October 2011 production I was tempted bythe opportunity to take a fresh spin on a well-loved tale. 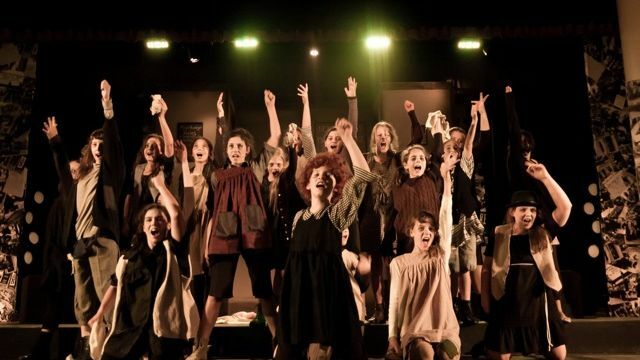 I wanted to present a classic Broadway show in a modern way, and was strangely tempted by the challenge of directing sixty young performers in two children’s casts. Annie is set in 1933 New York, when poverty and despair plagued America. I began researching the time, reading copious first person accounts of what it was like to live in Hoovervilles and sifting through many images from the time. One image in particular caught my eye. The people seemed completely defeated, starving and hopeless. Ironically, behind them was a billboard which boasted a ridiculously happy American family in a car with the caption, “Americans enjoy the highest standard of living.” The contrast between the reality and the dream was captivating – no one on that line could have believed in that billboard, but what if one of those people was a child? A child could believe, that despite everything, that happy family was possible. Suddenly, the concept for our production was born. Annie would be a production that celebrated the magic of a child’s optimism and imagination by presenting the story with its two contrasting worlds through the eyes of a child. We would utilise every element of musical theatre by directing and choreographing our actors in two differing styles. In the world of the Hooverville and the orphanage our actors would act in a very realistic way. In contrast, the world of Daddy Warbucks’ mansion would be filled with quirky, off-beat characters whose performance would be borderline melodramatic. Similarly flamboyant dance would be used to capture the magic of Warbucks’ mansion. Producing the show from the perspective of a child meant that we needed to ensure that our set, costumes and lighting created a show that was visually captivating. We took inspiration from Tim Burton’s work. The costumes, make-up, set and lighting for the orphanage and the Hooverville would be in a black, grey, white scale with some muted blues, greens and reds, while Warbucks’ mansion would be filled with bright primary colours. The costumes and set were designed to represent the style and fashion of the 1930s, with surreal aspects to create that vivid, dreamlike feel. The set consisted of three rotating pieces. Each piece would turn to form either the orphanage or Daddy Warbucks’ mansion. The fly tower would create the surreal and colourful aspects of Daddy Warbucks’ and Fifth Avenue. For example, the mansion would have several birdcages filled with light bulbs hang from the ceiling like chandeliers, while in Fifth Avenue we would cover the sky in brightly coloured street signs pointing in all different directions. In twelve hours we saw over one hundred and thirty people, ninety of whom were incredibly talented children. Our selection process was made easier by clear guidelines and character descriptions for each role. For some roles the decision was clear-cut, for other roles even creating a call back list was an arduous task. But in the end two talented Annies, supported by brilliant children’s casts and an amazing adult cast emerged. Meg: Billy, no show I’ve done has ever been this on track. We’re doing really well. Billy: (grabs a table and drags it towards Meg) Meg! Touch some wood, touch some wood! You’ll jinx us! Meg: Billy, don’t be stupid. Everything’s going to be fine. Nothing will go wrong. Seriously, what could possibly go wrong? Billy would never let me forget this conversation. Exactly six weeks out from opening night, I was told that the Rockdale Town Hall had been closed down indefinitely. This meant Annie no longer had a venue. We had no choice but to continue rehearsals and set building as normal. And while we carried on like normal, we searched frantically for venues. The search was tricky, we were limited to area because of our rights agreement, and with dance concert season looming many of our options had already been booked or were too small. After two weeks we had a saving offer from Sydney Technical High School. Producing a show in a high school hall was definitely not ideal. We had no dressing rooms, very little wing space, a smaller stage, no fly tower and no room for an orchestra, and we had the task of setting up and putting down 200 tables and chairs every time we performed or rehearsed on a school night. The venue demanded many compromises to the set. The absence of a fly tower meant that we would lose many of the surreal aspects of our set (birdcages, street signs, copious paintings). Another large problem was the size of the stage. The Rockdale Town Hall has a large stage, so while our three rotating pieces would have moved gracefully they were now crammed, dwarfing the stage and becoming a nightmare to negotiate. We needed to build a stage extension to add at least another three and half metres. Some very dedicated cast members and fathers were called to build it before opening night. The only way the cast could enter and exit into and out of the wings was via the auditorium itself, so we had to invent make-shift wings using scrap bits of timber and curtain that would hide these entrances. The cast had to negotiate make-shift dressing rooms which we scattered across the school. Dressing rooms could be found on the playground outside the hall, in PE change rooms and in the school gym. By the time we created our stage it was the day of our first tech run and we didn’t have time to run every scene. The dress rehearsal was, in one word, a nightmare, as our stage crew tried to negotiate the large set and cast in a tiny space. At the end of the evening we had only just reached scene three in act two, and the only comfort I had was the fact that we had three more dress rehearsals scheduled before opening night. Or at least that’s what I thought. On Tuesday morning I was told that the hall had been double booked and we could not rehearse on the stage that night. Thousands of emails and texts were sent as the cast rallied to make the best of a bad situation. 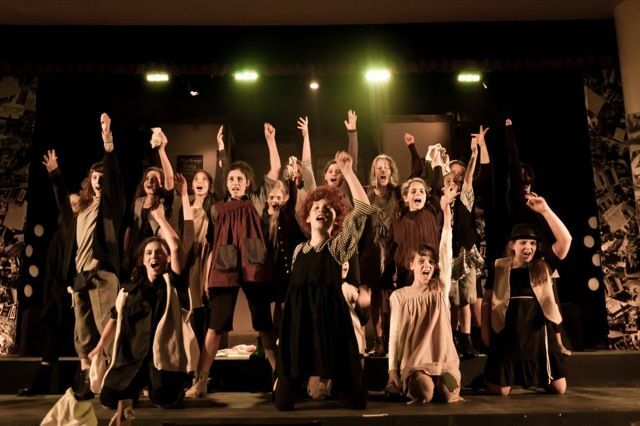 The ensemble danced for two hours at another venue, and Red cast ran the scenes early Wednesday afternoon directly before Yellow performed the final dress that night. Thankfully, it was a good run. The set was starting to move well and it looked phenomenal, the costumes were great and each cast member brought an energy and life to their characters – the adult ensemble in particular nailed their characterisation perfectly. On opening night, I was filled with a great sense of pride to see Annie journey from the dreary glum reality of the orphanage into the magical world of Warbucks. This was an achievement which would not have been possible without the patience, dedication and generosity, hard work and team effort of the cast, crew and the amazing orchestra members who climbed a ladder to get to the pit. Originally published in the January / February 2012 print edition of Stage Whispers.